Win The “Ultimate Trip” To Japan! 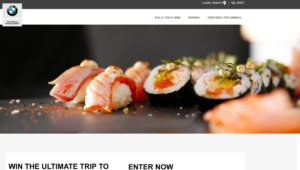 BMW and Tasting Table are giving you a chance to win the “Ultimate Trip” for two to Japan. The prize includes a visit to Tokyo, Kyoto & Hakone and airfare, hotel stays, Away suitcases and more! Win A Trip For Two To Japan! The Japan National Tourism Organization is running a sweepstakes where one lucky winner will win a trip for two to Japan! Kim, Lucas and I visited Japan a little over three years back. At the time, Lucas was close to 1.5 years old. We had an awesome time and Japan ended up being a great destination for a toddler. One of these days, I’d love to go back to Japan and see more of the country. Boar’s Head recently came out with a Japanese inspired deli meat and they want to send one lucky winner on a trip to Japan! I’ve written many times in the past about how I love to check out McDonald’s around the world but rarely visit McD’s at home. Considering how involved Japan is when it comes to electronics and automobiles, I found it hard to believe that the country hasn’t made a passenger plane in 50 years. I’ve written many times about how I like visiting odd and quirky museums. A little over two years back, Kim, Lucas and I headed to Japan. While I had always wanted to go to Japan (I’d like to go everywhere! ), it wasn’t a place very high on my list. However, the country blew me away and the trip greatly over-exceeded any expectations. With Japan being a leader in developing technology, one thing that surprised me was the lack of Wi-Fi in public places and restaurants. ANA is celebrating their new Houston to Tokyo- Narita route which takes off on June 12, 2015 with a little contest. The airline is looking for help to create a caption which will be printed on a special ANA umbrella. The umbrella commemorates the inaugural flight and will be given to passengers onboard as a special gift!